Sony Ericsson has unveiled its new fashion phone which named as Jalou. The compact clamshell phone has been designed for the style-conscious with a small form-factor measuring just 73mm long. Featured with a 2-inch display which can be transformed into a mirror at the touch of the button, Jalou is also equipped with a 3.2-megapixel camera with video recording function. It also integrated with A-GPS, FM radio for the users to enjoy the music while on the go, a Walk Mate step counter which can be used to keep track of exercise. In addition, it is Bluetooth enabled and supports 3G. Besides, the company has also teamed up with Dolce & Gabbana to make a special edition of Jalou. 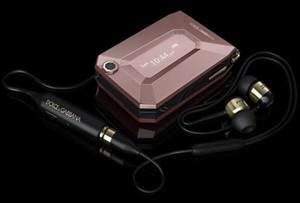 The Jalou Dolce & Gabbana edition has been designed with a rose-colored finish and 24K gold plating. It also comes with three satin bags to protect the phone or hold accessories, a Dolce & Gabbana branded headset with gold accents and supports D & G content. The Jalou phones are expected to be available in fourth quarter.